The first day of the Google I/O event gave us and the fans a thorough update of what was being baked in Google's busy kitchen, but as for the attendees – all 5000 of them had the privilege of walking away with a brand new, limited edition Samsung GALAXY Tab 10.1 dressed up in an eye-catching white outfit. Feeling like you want to grab yourself one as well even though the device has not been launched yet? If money is not an issue for you, eBay currently has at least a couple of these special edition Honeycomb tablets for sale with a four-digit price tag. With a little over six days until the auction is over, the special edition Samsung GALAXY Tab 10.1's current bid stands at $1001 without the shipping costs – twice as much as its starting price was when the item got listed a day ago. If you do not like to wait, there is another unit available from a different seller with a Buy It Now price of $1399 and free worldwide shipping included. 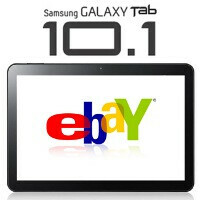 The slimmer GALAXY Tab 10.1 model is expected to launch in a little less than a month after Samsung decided to redesign it and make it about as slim as an iPad 2. However, a white version of the tablet has not been officially announced yet, and its release along with the black model is only a matter of speculation for now. No, this is the Google IO conference limited edition slim with white (and androids all over the back) being given out free. All the fat ones have gone to Vodafone..